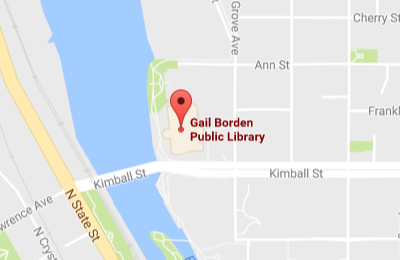 Located directly north of Kimball Street on the Fox River, the new Gail Borden Public Library stands as an impressive building to view, day or night, from its location at one of the major gateways to a revitalized downtown Elgin. Designed to blend with both the old and the new architecture of the area, the Prairie School-inspired exterior of the new Gail Borden Public Library creates a striking image from all directions. The two-story structure, clad in warm buff and terra cotta-colored stone, fits well in its Midwestern surroundings. Ample windows allow maximum use of natural light and provide seasonal vistas of the Fox River. 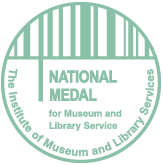 The site surrounding the library is landscaped with a variety of native trees and plants that frames the library and integrates it with the river's-edge setting. The building, located in the center of the library district, is designed for expansion to accommodate our growing population, which will increase from 110,000 in 2003 to 165,000 over the next 20 years.